Find Out More ... Call Melanie Today! We're easy to get in touch with! All calls, faxes and emails answered within 24 hours. 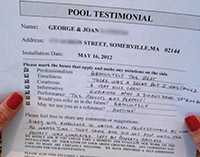 are raving about our high quality pool installations!